Rain barrels are making a comeback as droughts, watering restrictions and storm water runoff are on the rise. 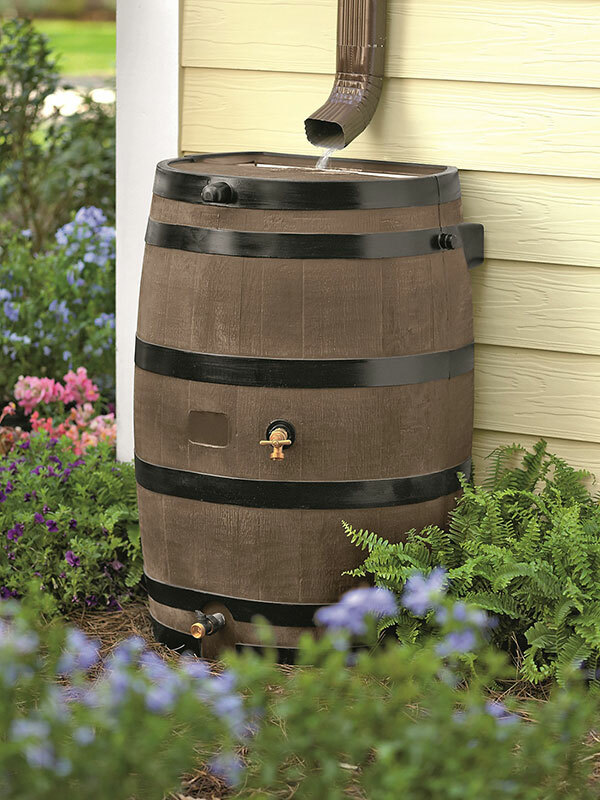 There are now many attractive rain barrel options to choose from. Photo courtesy of Gardner’s Supply Company. Too much or not enough water and never when you need it seems to be a common lament of gardeners. Reduce the impact of these weather challenges while conserving water, saving money on water and sewer bills, and growing beautiful gardens with the help of rain barrels. These century old devices are making a comeback as droughts, watering restrictions and storm water runoff are on the rise. Contact your local municipality before getting started. Some communities have regulations and guidelines for using rain barrels and many offer rebates to homeowners who install them. Start your conversion to rain barrels one downspout at a time. You can capture as much as 623 gallons of water from 1,000 square feet of roof in a one-inch rainfall. This can be a lot to manage when first adapting to this change of habit. Taking little steps allows you to successfully match the use of rain barrels to your gardening style and schedule. Make your own or purchase one of the many rain barrels on the market. 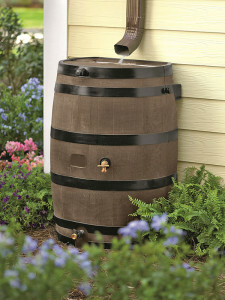 Regardless of which vessel you choose there are some features to consider when adding a rain barrel to your landscape. Make sure the top is covered to keep out debris and mosquitoes. Or select one with a solid lid and opening just large enough to accommodate the downspout. Look for one with a spigot low on the barrel, so water does not stagnate at the bottom. Use the spigot to fill watering cans or attach a hose. Elevate the barrel on cinder blocks or a decorative stand for easier access and to increase water pressure. Make sure there is an overflow outlet to direct excess water away from your home’s foundation. Or use it to link several barrels together, increasing your water collecting capacity. A downspout diverter is another way to manage rain barrel overflows. When the rain barrels are full this device diverts the water back to the downspout where it is carried away from your home’s foundation. And the good news is you don’t need to overlook beauty for function. You’ll find many attractive options in a variety of shapes and sizes in garden centers and online catalogs such as Gardener’s Supply (gardeners.com). Some include a recessed top for storing accessories or growing a potted plant. You’ll find ones with decorative finishes that mimic a basketweave, fine terra cotta, or wood. Those with a flat backside like the Madison rain barrel fit right next to the house, saving space. Rain water is naturally softened and free of flouride and chlorine; great for plants. Do not use rain barrel water for drinking, cooking or your pets. Avoid concerns of contamination from roofing materials and debris by only using the water for ornamental plants. Maintenance is easy. Check for and remove twigs and debris that may collect and block the flow of water. Clean the inside of the barrel at least once a year with an environmentally friendly detergent. Those in cold climates need to drain the rain barrel and cover the opening or turn it upside down for winter storage. Make sure to divert the water away from the house once the downspout is disconnected. Don’t worry about mosquitoes. Covering the opening with a fine screen and using the water on a regular basis will minimize the risk. Or use the eco-friendly bacterial agent Bacillus thuringiensis israelensis (Bti) that kills mosquito larvae, but is safe for pets, people and wildlife. Now is the time to start putting rainwater to work for you and your garden. Look for convenient locations for collecting and using rainwater from the roof of your home, shed or garage. A little effort put in now will result in benefits for years to come. Melinda Myers has more than 30 years of horticulture experience and has written over 20 gardening books. 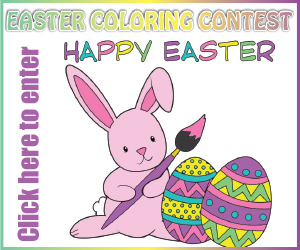 Myers’ website is: http://www.melindamyers.com/www.melindamyers.com.